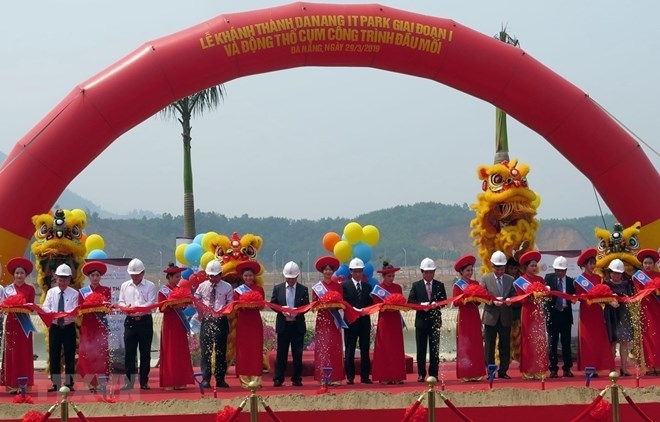 Da Nang IT Park Development Joint Stock Company inaugurated the first phase of the Da Nang Information Technology Park (Danang IT Park-DITP) in Hoa Vang district on March 29. At the inauguration ceremony, Deputy Prime Minister Vu Duc Dam said that as information technology is playing an increasing role in socio-economic development, IT centres like the DITP will help attract high-quality human resources inside and outside the country. “The Government always creates favourable conditions for Da Nang city to enhance investment in the IT sector”, he stressed, expressing his hope that more capital will flow into the city’s IT projects. The park, which covers 341 hectares in Hoa Vang district with total investment of more than 120 million USD, aims to become the central Vietnam’s “Silicon Valley”. The first phase, built at a cost of 47 million USD, has completed infrastructure, office and working space for rent on 131ha, ready to serve investors. The second phase of the project, spanning 210 hectares and costing 74 million USD, will be implemented in 2019. According to Chairman of Da Nang IT Park Development JSC Nguyen Tam Thinh, the park expects to create revenue of 1.5 billion USD and generate 25,000 jobs each year. Besides, it will encourage the training of advanced technologies at local universities.